GEISHA has been developed within the context of the Global Lake Ecological Observatory Network initiative called “Storm-blitz”. “Storm-blitz” assembles an international group of investigators interested in contributing to theoretical discussions and sharing data to answer questions about the impacts of storms on phytoplankton communities. 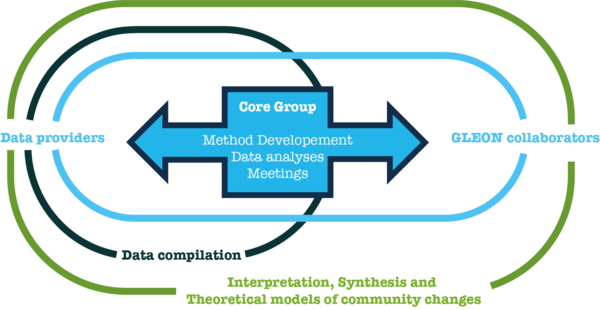 The storm-blitz group has recognized the need for a well-structured core-group of researchers to focus on data compilation and analysis. This core-group was created in 2016 and gathers 17 researchers with diverse set of skills an experiences. Supported by the Center for the Synthesis and Analysis of Biodiversity (CESAB) and the USGS Powell Center, GEISHA’s objectives are to catalyze research and provide financial and technical support to this core-group. GEISHA is a team-based network science collaboration whose functioning requires strong interactions between the core-group, data providers and other collaborators. So far, it has grown to over 50 investigators. We aim to promote and develop collaborative relationships across all group members by integrating team science concepts into GEISHA.